SKIN CARE | Gescina The Chemistry of Nature Inc.
Seabuckthorn Oil is an amazing health-support plant,which has been studied at length by numerous organizations. It has been used by human for centuries.Our expertise in the production of Seabuckthorn Oil exceeds 30 years and originates from Kazakhstan, where Seabuckthorn plants grow naturally, along with wild apples. The Seabuckthorn plant has many aspects to it.The bark,leaves and roots could be used for a variety of health remedies,including mucous membrane disorders,skincare and other health issues. Seabuckthorn oil extracted from seeds and berries contains number of the most valuable Vitamins,nutrients, natural substances and minerals known to man. Seabuckthorn(SB) – is the only plant on Earth that contains 4 OMEGA’s- Omega-3, Omega-6, Omega-7 and Omega-9! In overall, Seabuckthorn contains more than 67 natural health-support substances,which are beneficial for skincare and health support. Seabuckthorn oil is perfectly applicable directly to many skin disorders. It is included in our amazing face and body creams,balms,salves,lotions. 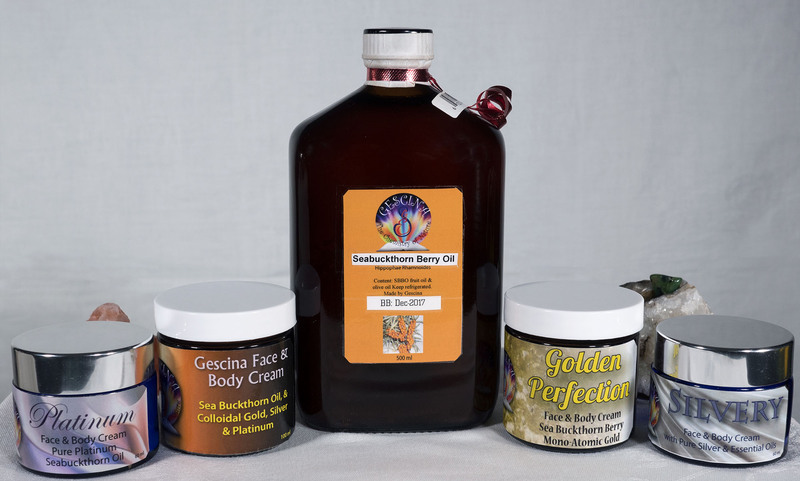 FACE and BODY CREAMS containing Seabuckthorn oil and pure colloids of SILVER,GOLD,Platinum and in some cases- other catalytic elements as Copper or Zinc.